EBBING Branding + Design, in collaboration with partner creative agency Mighty Few, was tapped to rebrand Green Flash Brewing Company. From a strategic base, we set out to evolve the logo and completely rethink the packaging to both better communicate the brand ethos, and connect in a more meaningful way with consumers. We approached the design development with an emphasis on storytelling as a means to really connect with the target audience. Despite the products and their illustrations being diverse in color and content, we achieve remarkable brand cohesion by rooting the stories in a common brand spirit and executing the artwork with a consistent style. Tropical DNA Hazy IPA 6-pack, bottle label, can design, can box. Soul Style IPA 6-pack, bottle label, can design, can box. GFB Blonde Ale 6-pack, bottle label, can design, can box. EBBING Branding + Design and Mighty Few worked in collaboration with the Green Flash team to develop story concepts inspired by each product’s name. Each unique illustration is the result of intensive story and composition iteration. 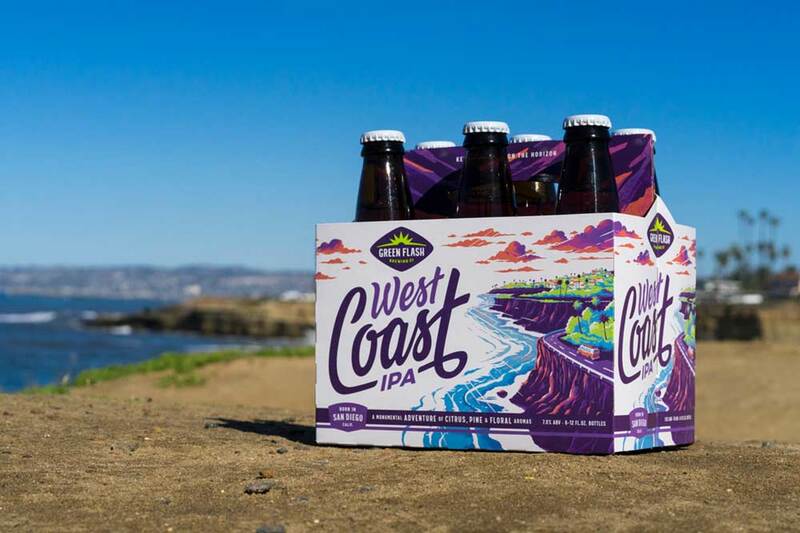 The resulting custom artwork conveys a style, spirit and story that connects the Green Flash brand with consumers. See what's new, when it's new. ©2017 EBBING Branding + Design, LLC.